Historical research helps us understand how past decisions and actions influence the world we live in today. Annette Scherber, a graduate student of public history at IUPUI in Indianapolis, is focusing on gender and environmental history. 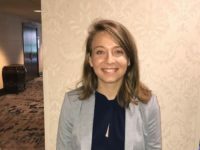 She recently shared her research at the Indiana Recycling Coalition Annual Conference. Her work recalls and highlights the impact women have had on environmental activism within the state of Indiana. Scherber’s thesis examines the impact of Indiana women upon the protection of waterways from pollutants in laundry detergent and the development of women’s organizations that pursued environmental activism. During the late 1960s, the use of phosphates in laundry detergent became a concern among residents of North America due to the eutrophication of ponds, lakes, and streams. Eutrophication is the evolution of lakes into swamps due to ever increasing quantities of vegetation. Driving the concern was odorous, green algae growing on the surfaces of lakes. While eutrophication normally occurs over a period of thousands of years, human use of phosphate detergent accelerated this process. Phosphorus is a plant nutrient. In 1970, Mrs. Robert Kilkenny led a group of Indianapolis women to press for the removal of this pollutant from their laundry detergent. According to Scherber, “As women sifted through conflicting information regarding detergents and water quality, their opinions and their private laundry practices became highly publicized in conversations grappling with environmental regulation, technology, health, and hygiene.” Using their role as primary caretakers of the home and consumers of the phosphate detergent, they handed out information to other women as they entered and exited grocery stores. This activism led to an Indiana ban on phosphate detergents in 1971. Although phosphate detergents were only one of the pollutants causing eutrophication, Indiana became the first of 27 states to ban phosphate detergents. While passed in 1971, the ban took effect January 1, 1973. Debate regarding the wisdom of the ban began immediately. Many detergent manufacturers and others initially opposed the ban while environmental groups supported it. What is unique about this debate was the way both sides sought to influence the opinions and buying habits of women. With the phosphate ban, women began to recognize the impact they had on pollution and the environment through the household products they bought. Consequently, many adjusted their purchasing habits to become more environmentally friendly. Established women’s groups, such as the League of Women Voters and the American Association of University Women, became active in environmental causes. And, new groups formed in an effort to attain environmental policy change. The Northside Environmental Action Committee was formed by a group of Indianapolis women during the same era to teach consumers about recycling and the importance of purchasing products that avoided excessive packaging. Hopefully, a better understanding of this history can help us influence future outcomes. If you would like to know more, you can read more about Scherber’s research. Thanks to our intern, Vic Roe, for researching and writing this blog post!